Anne Arundel County has a unique blend of natural beauty, historical significance, and city culture. Situated along Maryland’s Chesapeake Bay, the region is highly picturesque and appealing for potential residents. Water activities such as boating or fishing dominate the area due to its proximity to the bay and neighboring rivers. From charming hiking trails to the historic Annapolis city, the bayside county is bursting with attractions. In addition to Maryland’s capital city, Anne Arundel County is also home to the United States Naval Academy. This community has something for everybody and it is no wonder that over 500,000 people call Anne Arundel home. Contact Cedar Square Homes today for more information about how our services can benefit you! When life changes, your home must evolve to meet newfound needs. From welcoming a new life into this world to opening your home to elderly relatives, additional space in your home is needed during these life transitions. Home additions skip the headache of moving by making use of your established space and expanding it to fulfill a specific purpose. Increase the square footage in your home with home additions from Cedar Square Homes. Our home addition services support growing families with additional space and boost the market value of your home. No matter what the circumstance may be, a home addition can help you achieve your goals and accommodate all life stages. Cedar Square Homes builds custom porches for homeowners in Anne Arundel County. 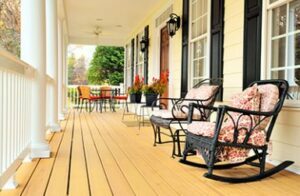 These porches present several benefits. These benefits include an upgraded exterior appearance and heightened home security. In addition, porches also provide an area for outdoor relaxation and add to the building’s usable space. A beautiful porch can transform your home, increasing its curb appeal and boosting the aesthetic value. The home’s architecture will be brought to life with this extension, adding to the home’s personality. Additionally, custom porches also benefit your home’s security and provide a functional space to enjoy the outdoors. Entries to the porch will be secured with locks, further preventing potential break-ins. Choose screen in porches to experience the best of the outdoors without the irritating interference of bugs or animals. Contact Cedar Square Homes today for our renowned custom home builder services in Anne Arundel County! Whether you seek to enhance your garage space or remodel your kitchen, our team has the skills needed to perform a variety of services. We deeply value customer satisfaction and ensure quality results. Connect with us or explore our website to learn more!